These are the minimum safety standards. Your compliance is required at all times for your jobsite safety when using this product. Observe and comply with all OSHA and other safety standards and codes that apply to roof safety. Fall protection devices should always be used when working on roofs. Appropriate personal safety equipment and work shoes designed for roof traction must be used. 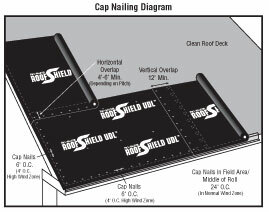 Before walking on the underlayment surface, roofers must fasten the synthetic underlayment securely to the roof deck with 1-inch plastic nails. Observe caution when walking or standing on the underlayment because varied weather conditions may reduce traction. Roof material staging devices such as roof jacks, storage platforms and toe boards must be securely fastened to the deck substructure to prevent the roofing materials from slipping on or falling off the roof. Steep pitched roofs require the use of roof jacks, work supports or platforms to assure safe footing while working on the roof. Follow the ladder safety standards and regulations. Observe the locations of all power lines and take precaution to avoid any contact with the workers or equipment. Be aware of weather conditions. Do not work on the roof when lightning storms, high winds, rain, ice and snow conditions are in the work area or ready to occur. Care should also be exercised when prolonged high temperatures may cause heat exhaustion. when the job is completed. Inspect installed underlayment that has been exposed to storms, wind or flying debris before installing the final roofing material. Repair or replace damaged areas. Remove any debris and take caution in coastal areas to remove any sand from roof before walking on it or covering the underlayment. Our synthetic underlayment is not intended for indefinite outdoor exposure and shall not be used as a primary roof covering. Final roofing material must be installed within ONE YEAR from the initial underlayment application. Use of staples or standard roof nails will void any warranty. 1. 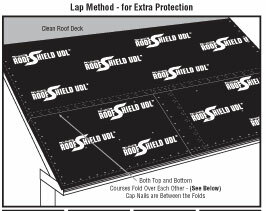 Synthetic underlayment must be installed above properly ventilated attic spaces (follow local building code) as it is considered a vapor barrier. Inspect, remove, and replace any defective roof sheeting. The roof deck must be clean, smooth, and dry before starting installation. A sharp straight edge-cutting blade is recommended to cut this material. 2. Install drip edge at the roof eave edges. 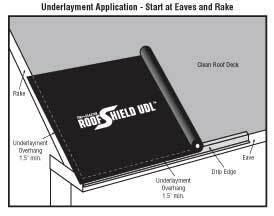 Synthetic roofing underlayment is to be laid horizontally (parallel to eave) with printed anti-slip side up, starting at the bottom of the lowest roof eave, with a 1.5″ underlayment overhang at the eave covering the pre-installed eave drip edge. 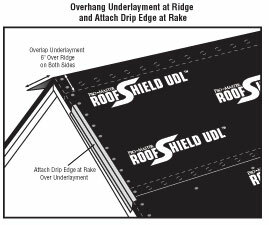 Overhang the roof rake edge 1.5″ and cover the underlayment with a metal rake edge trim. Material should be rolled out evenly but not rolled tight or stretched. Lay loosely over valleys to allow for expansion and contraction due to temperature variation. 4. ONLY USE 1″ diameter plastic cap roofing nails. Nail down squarely (90 degrees) into the deck to secure caps flush to the underlayment. In normal wind zones the nails should be driven at 6.0″ O.C. (on center) on both head and end laps. Fasten the field area in the middle of the roll a minimum of 24″ O.C. in normal wind zones. In high wind zones or coastal applications increase the fastening rate to 4.0″ O.C. on head and end laps. The field area should be fastened at 12″ O.C. minimum. Plastic capped nails may be hand or machine applied. over the 2 layers 2″ at the top and nail every 6 inches in the middle of the fold area to secure the head lap. Lift the loose material and position as the second horizontal course. Nail all edges and field areas as instructed. 5. Overlap vertical roll end by 12″ or 20″ depending on pitch. Overlap successive vertical courses by 4″ with the higher course lapping over the lower course, and by 6″ on roofs with slopes of less than 3:12. Lap at least 6″ over the ridge. 6. Use ASTM D4586 Type 1, Federal Spec SS153 Type 1 (Asbestos Free) plastic roofing cement on seams or joints that require sealant or adhesive. Butyl rubber roofing tape may be also used to seal lap seams. When the underlayment will not be covered with roofing material for a prolonged period or it will be exposed to wind driven rain, the laps should be sealed with cement or taped. It should be nailed in accordance with the recommendation for high wind areas. 7. Install a single vertical length of underlayment roll centrally over hips and down valleys before weaving horizontal underlayment across the valleys and hips. This also applies to metal hip or valley flashings that may be specified. 8. Install underlayment a minimum of 6 inches up roof protrusions or vertical abutments. Seal with adhesive sealant or tape as described in section 6. Install final flashing material. 9. When underlayment is to be covered immediately with battens, it can be secured with a minimum of fasteners to hold it in place while the battens are installed. Care should be exercised to place the 1″ diameter plastic cap nails in an area that will not interfere or be covered with the batten strips. 10. Determine local building code requirements and check to ensure compliance of methods and materials required for the job. 10 square roll: $166.35 (only 17 cents a square foot)!! $24 per roll anywhere in the Continental United States. Please call for pricing on five or more rolls.